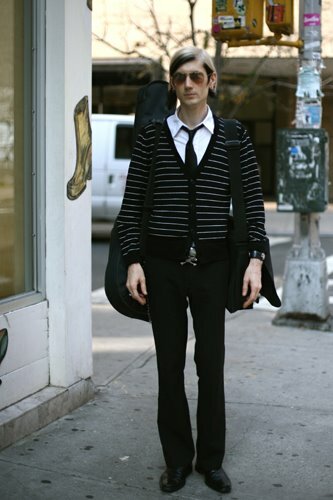 I think it’s enough with the bootleg pants for men now, I’m trying to phase them out of my wardrobe.But the top half is pretty cool, minus the face and the hair.So just the cardi,the tie and the shirt then.Ok. Is that . . . is that Doc Hammer? This guy works this look well, but very men can get away with this. Really, there are only a handful of cities where you can pull this look off. Not for the faint of heart. But this gentleman works it perfectly. If it weren’t for the stripes on the sweater and the sunglasses, his clothes would look exactly like the winter uniform of the boys’ school across the road from my high school years. And good they looked, too. It’s Franz Ferdinand meets A.F.I. Very cool. It’s the hair too! Always makes me wonder if the entire wardrobe fits this colour scheme. Guess it’s pretty passe these days to get highlights/colours to simply accentuate one’s skintone!!! it seems to be all about the skull and bones this season in everything. Looks like a very poor fly costume for halloween . . . Very slim, the tie tucked into the sweater is a nice touch. The bags on both arms are funny. It adds a weird weight to the picture… in an interesting and good way. I say he looks great, even though he could have done something more interesting than the River Phoenix haircut. As to the skull and bones, is that a belt buckle, on the end of his tie, or on the bottom of the cardi? Love the thin tie, gotta get one! By the way Sart, I think your photos are great, I’m impressed by the way you handle your subjects regarding pose, (or lack of) and depth of field and background detail. Any chance you could say what equipment you use? Yes, I thought Andy Warhol, too! I agree that the bootcuts are soo played out on guys. Slim fit or straight leg for me…such a nicer shape and it makes guys improve their posture as well. Like the blond hair though–an improvement on the hipster mess uniform hair. I’m glad you’re back in NY for the best season for fall, the best season for Fashion. Paris and Milan are boring to see–style is the norm. here, they are jewels in the rough. The hair is natural, if that is indeed Doc Hammer of Venture Bros fame. Read his wiki (linked above, courtsey of anonymous) if you’re curious to know about the hair color. I feel he pulls off this look quite well. Oh, yes. I like it. Oh it’s definitely Doc Hammer of “The Venture Brothers” fame. There are other pictures of him on the web showcasing his interesting style although I think it works mostly because he’s so slim. get over it. he is trying way too hard and definitely not pulling off the look. obviously much older than he is trying to look. the dyed hair and outfit is a big stretch for this guy. people should learn to dress according to who they really are. dont try to be something that you aren’t. assuming this is not an expression of who he is may not be entirely accurate or fair. i actually don’t like this. maybe he looks too skinny – which isn’t normally a problem – or maybe it’s the crispin glover haircut. i think he should not have gone with a white shirt. it’s a little bit too moddish goth. Could be a women’s silhouette these days too ! i like the sweater! and well yea very Brit. Too Mod/Goth? That sounds like a perfect combo to me. And I don’t remember seeing it pulled off this well before. Hee! Hilarious comments. This beautiful man is a huge Goth from back in the days when that meant something. So, no, he’s not trying to hard to be something he’s not. This is what grow-up Goths look like. This is our fashion legacy to you, glad you enjoy it. Plus he’s hot, and exceeedingly, disgustingly talented. Yum. Doc Hammer as always looks amazing! lol @ all the people crying about his natural hair colors. people are calling him out on his dye-job. from what I understand, his hair naturally does that. People, people, that is not a hair bleach or dye job. The gentleman in the picture is Doc Hammer, an artist in a number of medias who has a skin condition called vitiligo which causes loss of pigment in the skin. In this case his scalp; thus the white streak in his hair. Research a subject before so cruelly making fun of a person’s style. Now only if I could get him in bed. Thats Doc Hammer! Go Team Venture! Dyed hair? Guess again. That's natural sweeties. Also, can anyone else see a little "dean" in his lanky-ness? Anyone who's hair naturally grows those colors can wear whatever he wants. I fully love the way Doc dresses. Doc Hammer could make a used sweat suit look stylish, he is just that cool. I think I'm in love! I love the cardigan, and I am a sucker for a man in a tie. Attention guys: ties are awesome; please wear them more often! still the love of my life. yes, this is the second time i have commented on an ancient post.